May 4, 2017, 9:04 PM · A Moscow-based quartet called Russian Renaissance has won the $100,000 M-Prize, which was announced Thursday at the the second annual M-Prize chamber music competition hosted by the University of Michigan's School of Music, Theatre & Dance. 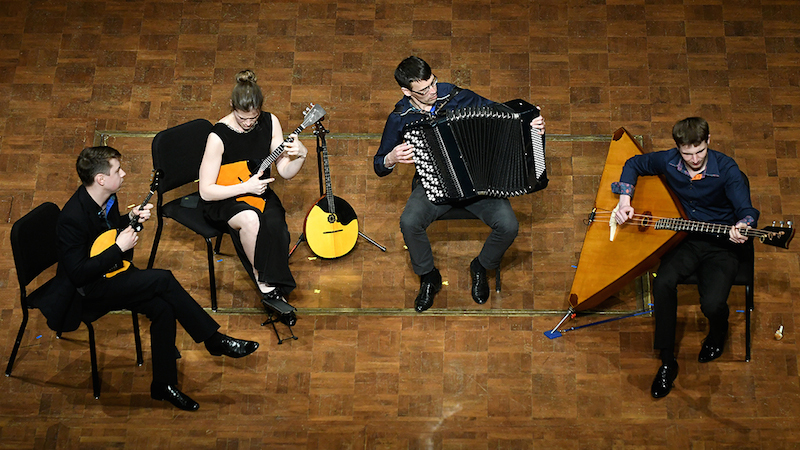 The group includes members Ivan Kuznetsov, balalaika; Anastasia Zakharova, domra; Aleksandr Tarasov, button-accordion; and Ivan Vinogradov, balalaika-contrabasso. Since their debut in October 2015, the quartet has won a number of competitions and have performed in Tchaikovsky Concert Hall and Gnesins’ Academy Concert Hall in Moscow; Yota Space concert hub in St. Petersburg; and the Youth Theatre in Rostov-on-Don. Russian Renaissance. Photo courtesy of University of Michigan SMTD. The top winner in the M-Prize Senior Strings category was the Argus Quartet of New Haven, Conn, which earlier this week was named graduate resident string quartet at The Juilliard School. The Astera String Quartet of Chicago won top prize in the Junior Strings category. Jury members included former New York Philharmonic concertmaster Rodney Friend, Juilliard String Quartet cellist Astrid Schween, Swiss saxophonist Lars Mlekusch, flautist Carol Wincenc, multigenre cellist Jeffrey Zeigler and Grammy Award-winning soprano Dawn Upshaw. The M-Prize competition was created in 2016 by Michigan School of Music, Theatre & Dance Dean Aaron Dworkin to identify and showcase chamber music talent. This year's competition drew applications representing 41 countries and 60 performing arts institutions. Twenty-nine ensembles, comprising 112 artists from 7 countries, participated in the semifinal and final rounds May 2-3 at the University of Michigan. Last year's grand prize was awarded to The Calidore String Quartet. May 6, 2017 at 02:57 PM · Words from a cantankerous old patriotic string player (that uses a bow) would include disappointment that a foreign group that merely PLUCKS their instruments should be held in such high esteem and favor. Especially when their repertoire appears to be entertainment-type music, more suitable for dance-band venues....further disappointment that one of the judges is a former student....I musta not done such a glorious job as a teacher. May 9, 2017 at 07:23 PM · That seems a bit extreme -- if you watch the videos, the winning group displays virtuosity, inventiveness and a keen sense of ensemble. A pleasure to witness!